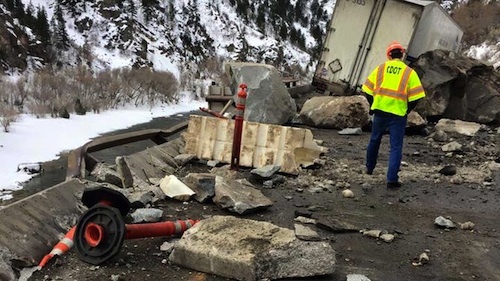 On Monday evening, a rockslide erupted releasing massive boulders and forcing the closure of 24 miles of Interstate 70, a major throughway in western Colorado. 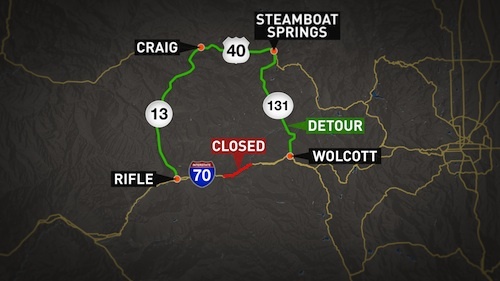 The closure runs from Glenwood Springs in the west to Gypsum in the east and drivers coming from both directions have been forced to detour at least 146-miles. While the Colorado Department of Transportation still isn’t sure when the highway will fully re-open, CDOT spokeswoman Tracy Trulove, says the best-case scenario is a partial re-opening on Thursday but they won’t be able to make that decision until about midday. Truck driver, Ray Hatch of Las Vegas, was among the first to encounter the rock slide and said that he saw the car in front of him disappear into a cloud of dust before his truck suddenly smashed head on into a boulder the size of a small car. Fortunately Hatch wasn’t injured and his tractor-trailer suffered the only damage in what could have been a highly dangerous event on a stretch of highway averaging 300 vehicles per hour. Ron Milhorn, news director of KMTS radio in Glenwood Springs, came upon the scene about 10 cars later and was forced to a stop about 100 yards from the debris before emergency crews escorted them back out of the canyon. Since then, drivers heading east or west have been urged to take 146-mile detour around the canyon to the north on U.S. 40 and there is also a detour route to the south on U.S. 50. But by Tuesday, hundreds of cars and semi-trucks were lining up at the western entrance to Independence Pass hoping it would also be a route leading around the canyon closure, unaware that it is closed for the winter season. I-70 is also one of the heaviest travelled routes for truck drivers across Colorado and the closure has left many stranded or facing serious delays. The situation is certainly making it far more difficult for any of them to do their job. 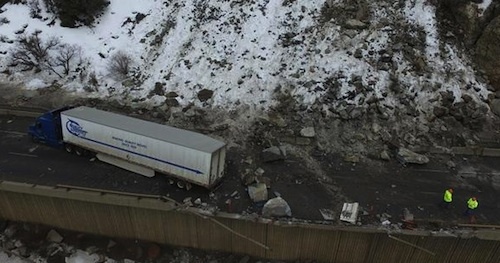 WalMart driver, Owusu Ansah, says he was hauling freight from Columbus, Ohio, to Covina, California, when he came upon the canyon closure on Wednesday evening. He has decided to wait it out until the interstate reopens because the detour route would end being far too costly with the expense of the extra gas. "When I got to the closure, I didn't know what was happening," Ansah said. "My dispatcher just told me to wait here." Tracy Trulove says that although crews have been working steady since Monday night, a second rockslide occurred on Tuesday evening and a great deal of work still remains ahead of them before the area will be safe. “Rock scaling and netting to deal with any future slides must be complete before officials can even think about allowing traffic to move again,” she explains. The CDOT says it may be more than a week before traffic is able to resume in both directions and possibly even a month before it can be fully reopened. Any truck driver sitting at independance is a fool for not checking the route before hand. Also when it snows up in the mountains other two routes may be impassable. But like William says no one needs to be stranded as 80 via slc works but for owner ops costs more of course. Also for companys but there drivers are not forking out extra fuel costs. That's Colorado beautiful but dangerous.